DUSK is the epitome of the 90’s shooter come back to life. This is a game reminiscent of Quake, Half-Life and Unreal, starting up with a mock-DOS screen so authentic I felt I was thrown two decades back in time. Everything about this game is an exercise in verisimilitude, from the feel of the weapons to the player character who ostensibly runs faster than any other game’s driving speed. The first feeling upon loading the game up was, admittedly, comfort. Developer David Szymanski cites a swathe of classic titles in his pitch of the game and each one is evident throughout DUSK, even in its early access stage. What is already here is an incredible show of all the things which made the early FPS genre such a force in the 90’s, and serves as a reminder of the roots of the genre. Szymanski regards the basic gameplay with a philosophy of “don’t fix what isn’t broken” – everything about the gameplay itself is familiar and feels drawn straight from a classic shooter. 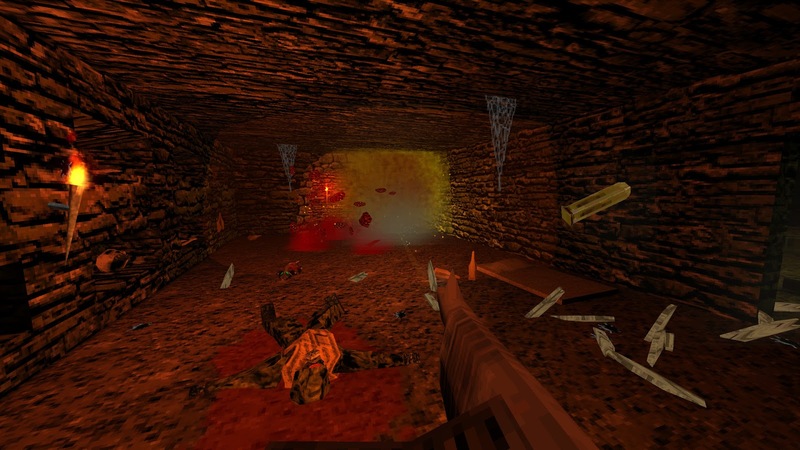 The game’s health and armor system, the hierarchical arsenal ranging from pistols to shotguns up to rocket launchers, the vertical maps with tunnels and springpads and the grotesque and menacing enemy designs all feel like hallmarks of the early FPS genre. There’s certainly an initial “map-hack” vibe to the game which I find works in DUSK’s favour: it shows that the developer has considered which elements should be kept static for means of gameplay, and which elements can be creatively reimagined. The level design is one of the game’s strong points, even in its early state, and manages to do some interesting things to mix up narrative and ludology. Levels tend to be built around a unique object, mechanic or setpiece which the player will then mentally associate with the level: you’ll fondly remember levels as “the corn maze one” or “the stained glass church one” because the levels themselves smartly choreograph their gameplay climax to coincide with eyecatching visual assets. The extensive use of keys, secret tunnels and triggers creates a sense that every level is hiding something, which complements the setting’s occult tone. There are currently two campaigns and two maps for endless mode, as well as some multiplayer maps which are sparsely populated. The game also portions out resources cleverly as well, giving the player a guiding hand without mandating certain gameplay styles. As with many early FPS games, different enemies are more succeptible to different types of guns purely because of their attack patterns. I liked to dispatch long range shooting foes with the rifle, slow moving foes with the shotgun and save the machine gun for swarms of small enemies – weapons feel like they were designed for certain scenarios, rather than for certain player fantasies. The levels are designed around the assumption that the player will use their weapons smartly, and so give just enough resources that you’ll need to manage them carefully, but you also won’t be stuck with just your melee sickles for too long. Levels are 15-20 minute affairs with no checkpoints either, so on the harder difficulties players will need to create a plan of attack in order to succeed. You’ll know where the ammo is and where the gauntlets of enemies are, so there’s a lot of strategising involved with picking the right place to use each weapon, and saving enough firepower for the segments where resources are scarce. The difficulty is also handled excellently. As with games like Doom and Quake, there’s a scarcity of enemies with hitscan weapons and instead you can dodge most threats by strafing left and right. The level design rarely spawns enemies behind the player, so every hit feels justified. This allows DUSK to have an extremely high skill ceiling, which allows dedicated players to get the most out of the game’s six difficulty settings, and even though death sends you all the way back to the level’s beginning, I always felt ready to have another try. I particularly liked how the enemy encounters and difficulty factor into the game’s story. The approach to narrative is reminiscent of games like Doom, which had next to zero in-game narration and just enough plot to justify its existence kept away in a game manual. DUSK takes this a step further however, using environmental design to tell an implicit story which puts the players’ actions into perspective. Szymanski has a natural talent for finding the story in a combat scenario: whether the player gets trapped into a room with a enemies, or they’re shooting at ranged cultists hiding in the rafters, there is a sense that there’s a story being told with the encounter itself. 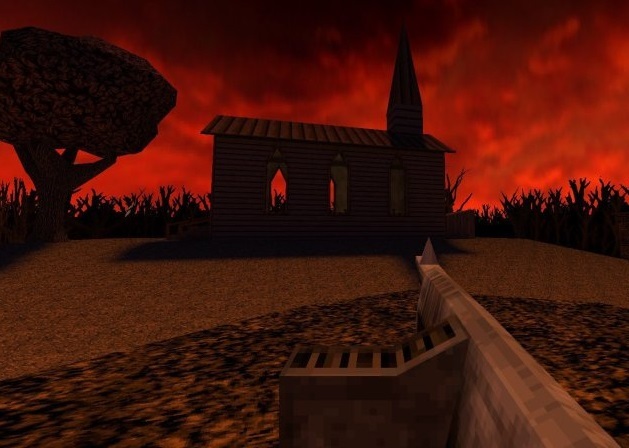 It helps that the enemy and location designs are focused on a pulpy middle-Americana horror aesthetic reminiscent of films like The Texas Chainsaw Massacre, The Exorcist and Children of the Corn. 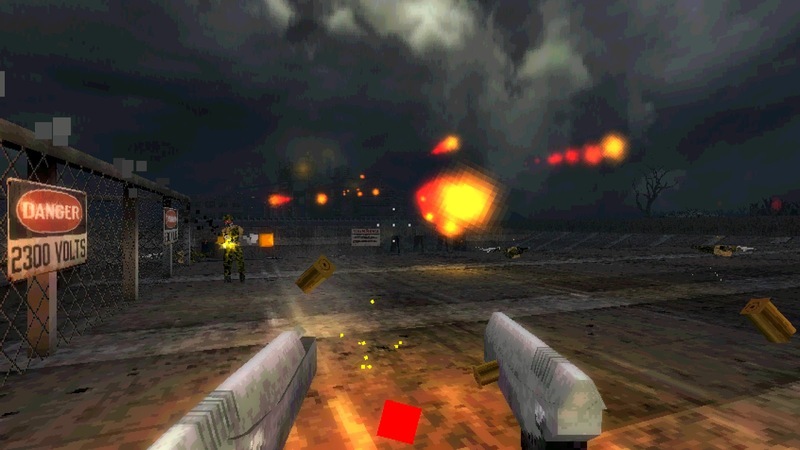 DUSK isn’t a particularly scary game, but it uses these images which have been branded into popular culture as a means of getting the player’s blood rushing as they shoot their way to safety. Ultimately, DUSK excites me because it has potential to be an “alternate-history” game – a game which explores what might have happened had industry forces not forced FPS games away from the high-speed arena shooters towards a more story driven approach that we see today. The player has to remember a time where FPS games were built gameplay-first instead of from stories and settings. DUSK takes a retro aesthetic and makes it its own, bearing a more cohesive vision than even some of the games we remember most fondly about the late 90’s era, and it channels a more satisfying reimagination of Doom and Quake than what we have seen from Bethesda’s big-budget reboots. DUSK is not only a powerful nostalgia hit, but a compelling argument that an old genre still can show some new tricks.